High Fibre dinner recipes, Fibre Rich Indian dinner recipes. High Fibre dinner recipes, Fibre Rich Indian dinner recipes. Dinner needs to be the most lightest meal of the day. However that doesn’t mean that you give up on the most important nutrients. Check a balance between the two for effective loss. Either opt for a soup and salad as a meal in limited portion size to get the feeling of fullness but yet light to the stomach. Garlic Vegetable Soup and Citrus Watermelon Salad or kale masoor salad with a light lemony quinoa and baby spinach soup would be just perfect addition to your dinner. Bajra, Whole Moong and Green Pea Khichdi and Oats Mooli Roti are creation of one dish meals to please your palate and body metabolism as well. If you are amongst those who can relish a bowl of subzi on its own, then try recipes like Gavarfali ki Sukhi Subzi or Hariyali Mutter with Flax Seeds Raita. We suggest fiber rich bajra roti, jowar roti, jowar bajra garlic roti or whole wheat roti to make a healthy combination with some fiber rich vegetables. These low calorie, high fiber recipes will not fail to please your palate is our challenge. So go ahead and try them and if you like them do share your comments and suggestions too! 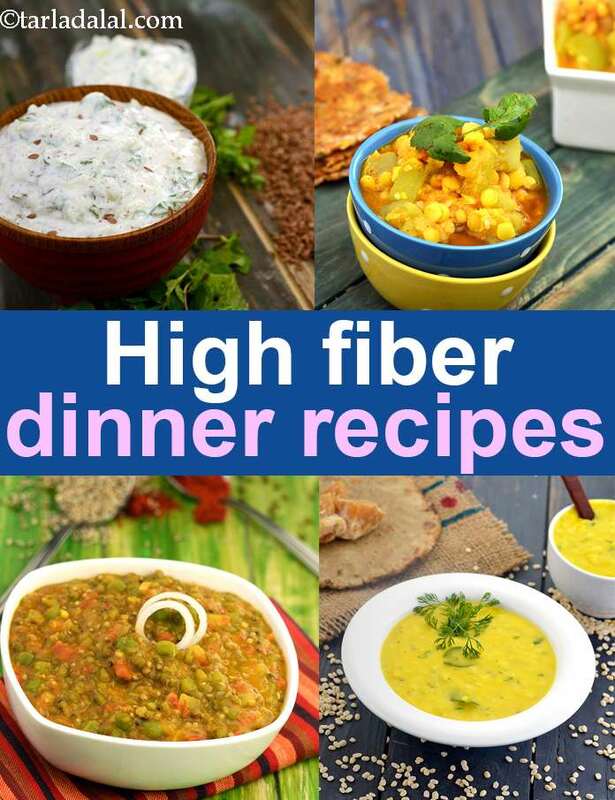 Enjoy our High Fibre dinner recipes, Fibre Rich Indian dinner recipes and other fibre rich articles below.